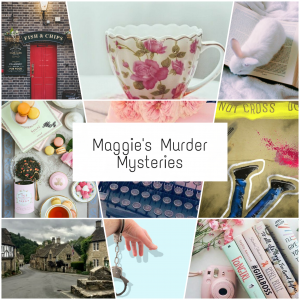 Maggie's Murder Mysteries - M.W. Maggie, author and bookstore owner, deduces that one of her customers, married to a local snob, is having an affair when she sells him two of the same books as presents. The next day he is found dead in the local hotel, and the manner of his death is tied to the hotel’s curse. When Maggie discovers that the victim’s mistress is one of her employees and was lured away from the hotel room that night, she takes out her magnifying glass to prove that someone human was responsible for that man’s sudden death. That isn’t made any easier when a group of ghost hunters show up and get hold of a sound recording of a ghost. Luckily she has the help of a handsome local detective, as well as her favourite fictional main character. Can she uncover the truth before another victim bites the dust?